High Quality Content by WIKIPEDIA articles! The motor company Iso Rivolta was an automobile and motorbike manufacturer, predominantly active from the late 1940s through the early 1970s. They are known for the iconic Isetta 'bubble car' of the 1950s, and for a number of powerful performance cars in the 60s and early 70s. 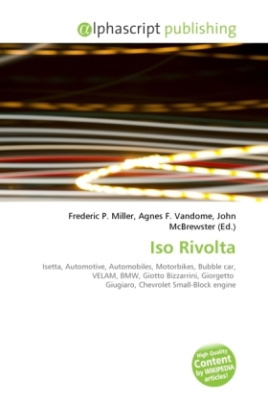 Iso Rivolta was initially named Isothermos and manufactured refrigeration units before World War II. The company was originally founded in Genoa in 1939, but was transferred to Bresso in 1942 by Renzo Rivolta, an engineer and the heir of industrialists. The business was refounded as Iso Autoveicoli S.p.a. in 1953 to reflect the production of motorized transport. Renzo Rivolta died in 1966, and his son, Pierro, took over as managing director. At the start of 1973 the Rivolta family ceded the business to an Italian American financier named Dr Ivo Pera who promised to bring American management know-how to the firm: the business was again renamed to Iso Motors, just before fading rapidly into obscurity. Two prototypes were shown in the 1990s, however, neither reached production.